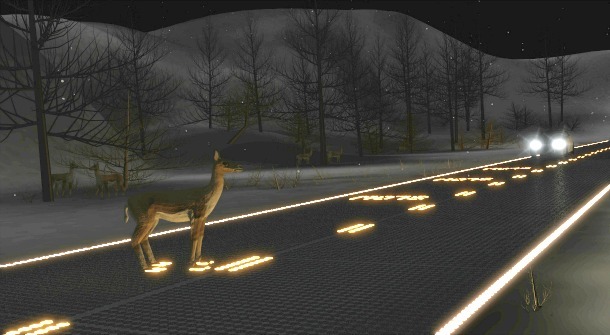 Recently around the internet, Solar Roadways have received a good bit of attention. Their big idea? To eventually replace roads with modular, communicating solar panels that serve a variety of functions, with even the potential to charge electric cars as they drive on them. Just on the 27th of this month, they were recently able to raise $1.5 million dollars on Indiegogo.com, a crowd-sourced fundraising site, well within their 40-day limit. That’s not to mention the extraordinary amount of attention and even funding they’ve received from the Department of Transportation, Google, and many other organizations. The basic premise of the product is a hexagon shaped glass plate with a textured surface that has solar panels, LEDs, and several other sensor and communication technologies embedded in them. Solar Roadways wants to replace our roads with something that is more easily maintained and actually has a payback period (potentially). The tiles will be able to communicate with each other, melt snow off frozen roads, display LED layouts, be easily replaced, handle road-water runoffs to prevent pollution, manage electric and various cables underground along the side of the roads, be pressure sensitive to objects or animals crossing the road, and much more. That’s the idea at least, and a very exciting one at that. But for now, they are still in their second prototype phase and dealing mostly with parking lots. Reviewing such an idea -- because it’s too early to call it a product yet -- is difficult because it’s tempting to nitpick at the individual components. But since they don’t really have even a final product out yet, unless you are reviewing their bid on a contract or part of their R&D team, it’s almost pointless. This is because Solar Roadways is trying to innovate. They looked at the problems they saw in our roads and infrastructure, took the old idea of solar roads, and now are trying to make a product out of it. This is the type of fearless innovation that America was built on and has nearly lost. So far, they’ve done an excellent job on social media, good enough to crowd fund their initial goals. Meanwhile, when evaluating such a “novel” idea with so many components, it’s important to keep both the hype and the doubt within perspective. First of all, Solar Roadways really does leave much to speculation. There isn’t much data on the product itself, much less on how they will behave under actual road conditions considering it’s still in prototype phase. As the idea currently stands, cost & payback period, installation, and customer base will be the most concerning aspects of these tiles. Beyond that, only basic pros and cons of the idea can be brought up when considering the merit of Solar Roadway. If they can keep the cost down, even if they are only 50% successful in reaching all their objectives, the product will work very well as a stationary road material. This means parking lots, driveways, and maybe a few other surfaces. Then once it has proven itself successful as a stationary road material, the challenge of creating actual solar roadways can then be undertaken. The cost must include installation costs, accompanying instrument costs to monitor the panels, the wiring, and the periodic replacement of the tiles. All these must factor into the repayment period, just as any other standard solar panel would. Although, the cost of these tiles as a whole will assuredly be more costly than just installing standard panels on mountings or on roofs. However, it is important to note that with this you are essentially combining two different items into one. When you consider the cost associated with this, the cost of both products should be taken into consideration. At the same time, when replacing an area with their tiles, the cost of tearing out the old pavement must also be considered. When it comes down to actual roads, the cost also must be compared to its value to all the associated parties. 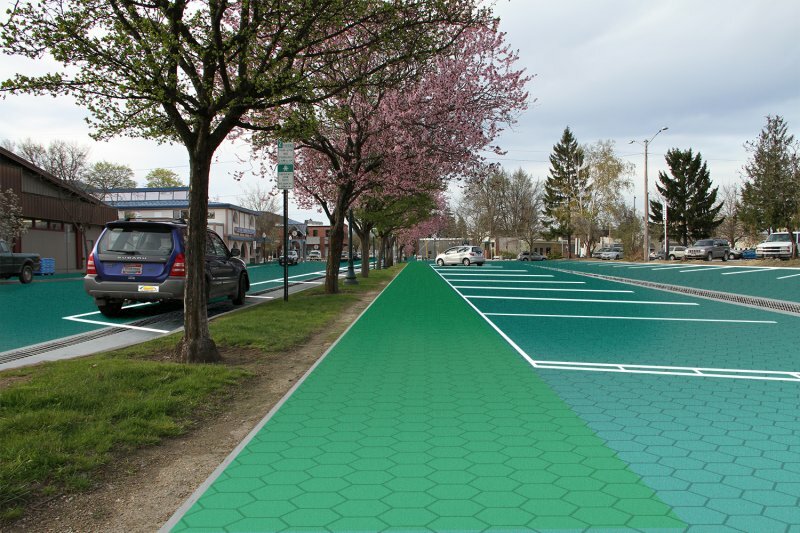 Will the cable companies and electric companies think it will be worth it to move their infrastructure into the Solar Roadway system? There are a lot of complications that come with this technology, especially when it attempts to be the silver bullet for all these problems. How these tiles are secured into the ground and their foundation will also be very important. Not only will they be a significant portion of the cost, but it will also determine how well it will transition from parking lots to actual roadways. How the foundation is laid also includes digging the supposed trenches for the water runoffs and electrical wiring, as well as ensuring the longevity of each of the tiles. The type of failures experienced by these tiles could be much more dangerous, even though the frequency could potentially be reduced drastically. Again, the company has not given much information on this matter, except that they have threaded holes that allow them to be screwed into the foundation. Probably the biggest question the Solar Roadway people should be asking now is who is their intended customer-base? On their website they mention municipalities, homes and businesses inquiring about the application of their product. But who will buy them, and who will install them? Can they find their niche in solar and coexist with conventional solar PV panels? If they cannot answer these questions, then the entire project will just be an expensive hobby from a couple in Ohio. With what they’re doing, it’ll be incredibly difficult to organize all the related parties unless the final product proves itself to be outstanding. For example, who will the ownership of the energy belong to if it’s built by a public entity? Will it be like a mini Tennessee Valley Authority each on its own? Obviously, not all roads can be solarized, meaning there will be stretches of roads left to conventional means. If implemented on a large scale, will municipalities have to have the equipment for both conventional road repair as well as new ones for Solar Roadway tiles? As it stands, all the technologies proposed in the tiles are current, and the final design isn’t far away. It would seem that bringing the final product into the world will most likely be the greatest challenge, even discounting all the rest of the pros and cons of the idea. Could reduce maintenance cost of wired infrastructure and improve detection, protection, add-ons, replacement, and overall security. Hype behind a seemingly wonderful and large idea is always risky, especially when it comes to trying to “re-invent the wheel” as it were. Scott Brusaw, founder of Solar Roadways seems to have a vested interest in this idea of electric roadways, and there is passion behind his product. 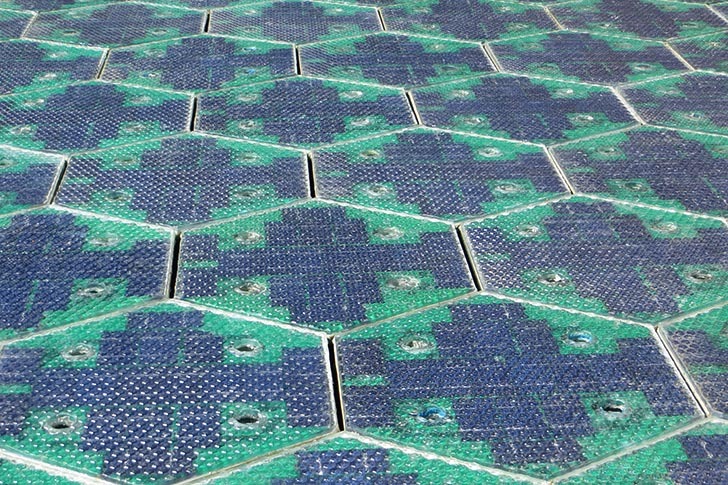 Solar Roadways is a bold concept that wants to reshape infrastructure, something very much needed in America. But time will have to tell whether or not his bold dream will come to furition.